Poland's payment market is growing rapidly. The total number of payments exceeded 5.6 billion as of 2016 and it is estimated to top 6.4 billion in 2017. Most transactions executed in Poland involve payment cards and the share of cards in total payments exceeded 57%, corresponding to over 3.2 billion transactions in 2016. The fast growth in card transactions could be attributed to increasing frequency in card use and a gradual displacement of cash. 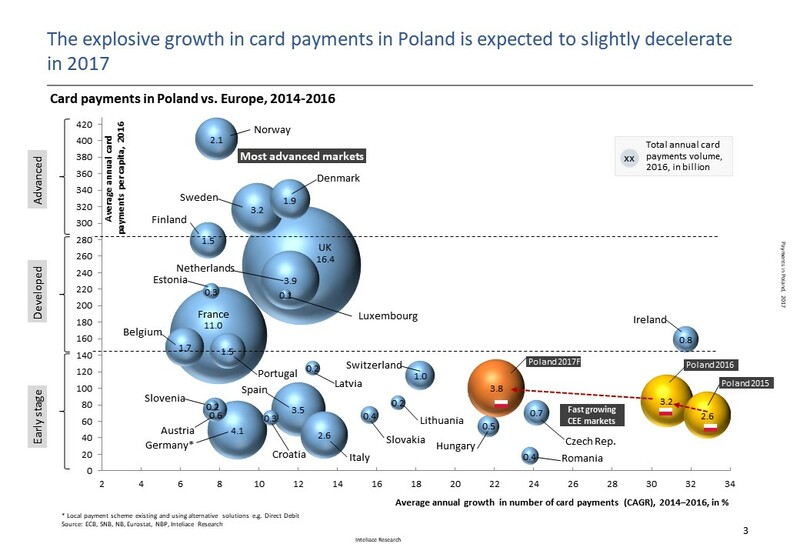 The growth in payment volumes in Poland is likely to continue as will the role of cards in overall payments. Thanks to the proliferation of POS terminals and alternative payment solutions, in particular, in sectors where they have not been applied before, e.g. in public administration, the Post Office, local authorities and in smallest stores etc, cash will continue to be displaced. Assuming that no change in current trends will occur, the total volume of payments in Poland is likely to reach 10 billion transactions within next five years.